DFT®‘s silent check valves are known around the world as the valve to use for preventing or eliminating Water Hammer problems. Designed to prevent “Water Hammer”. Designed to open at approximately 0.5 psi differential pressure and fully open at 1.0 psi differential pressure. 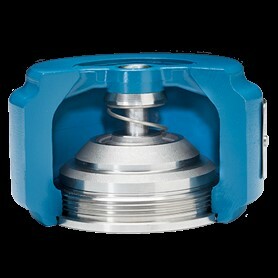 MSS SP 126-2000 Steel In-line Spring-Assisted Center Guided Check Valves Standard. API 6D – Pipeline Valves. API 6FD – Fire Test for GLC® Check Valves. Meets or exceeds MSS SP-61 leakage requirements. Available with soft seats for bubble-tight shutoff. NACE standards, MR0178 or MR0103. 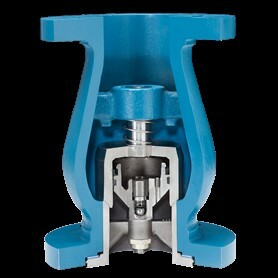 Maintenance and Installation guides available for all DFT® in-line check valves. The “Check Valve Doctor™” specializes in preventing check valve problems and failures. 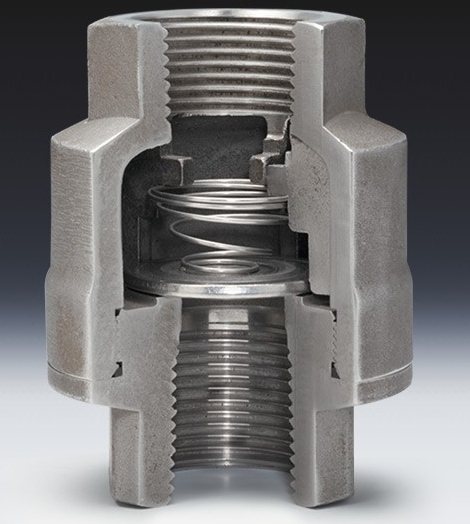 DFT®‘s in-line, spring-assisted, check valves prevent Water Hammer and reverse flow. Custom sizing allows DFT® to build check valves to your requirements for horizontal and vertical installations in liquid, gas or steam applications even in low-flow applications. WATER HAMMER is the generation and effect of high pressure shock waves (transients) in relatively incompressible fluids. Water hammer is caused by the shock waves that are generated when a liquid is stopped abruptly in a pipe by an object such as a valve disc. Symptoms include noise, vibration and hammering pipe sounds which can result in flange breakage, equipment damage, ruptured piping and damage to pipe supports. Whenever incompressible fluids exist in a piping system, the potential exists for water hammer. The risks of water hammer developing are particularly high when the velocity of the fluid is high, there is a large mass of fluid moving and/or when there are large elevation changes within the piping systems. Since the swing check must rely on gravity and/or fluid flow to help it close, flow reversal must occur before closure begins. When the swing check finally closes, it abruptly stops the flow and causes a pressure surge resulting in shock waves. These shock waves continue until the energy generated from this sudden action dissipates. The figure below displays typical pressure curves after closure of a check valve. These high pressure waves act against the piping and the valve, exerting very high forces. This causes severe stress on the metal and vibrations in the system. If the system is not designed to withstand these high transient forces, the pipe could rupture and/or other components in the system, such as pumps and valves, could possibly be damaged. These problems can be eliminated or greatly minimized by installing a spring assisted silent check valve. Silent check valves do not rely on gravity or fluid flow for their closure. Instead as the forward velocity of the fluid slows, the spring assist on the valve starts to close the disc. Due to the spring assist and the relatively short distance the disc must travel, by the time the forward velocity has decreased to zero, the valve disc has reached the seat and the valve is closed. With reverse flow eliminated, the forces necessary to produce water hammer on both the upstream and downstream sides of the valves are substantially eliminated as shown on the right side of figure shown above.